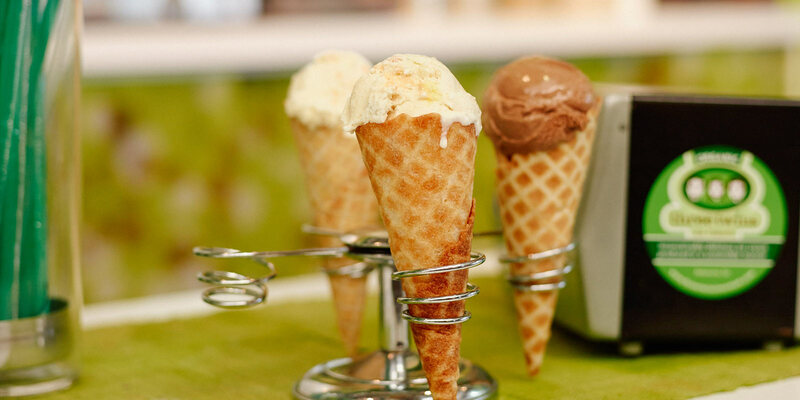 Three Twins Ice Cream is about one thing – inconceivably delicious, organic ice cream produced in a sustainable manner. Proprietor Neal Gottlieb is passionate about his craft and operates one of the few certified organic “scoop shops” in the country, with all of the ingredients organic and local wherever possible. Three Twins starts with a simple base of milk, cream, sugar and eggs, sweetened with evaporated cane juice and other delicious ingredients for a tasty finish. What they don’t put in is just as important and what they do put in. Three Twins ice cream does not include the artificial colorings, flavors and stabilizers common in conventional and some organic brands. No corn syrup or seaweed derivatives here! Flavor comes first, whether it’s a classic favorite or a special only-from-Three Twins creation. Three Twins is proud to use compostable dishes made from sugar cane fiber, spoons made bio-degradable corn resin, and cups made with PLA corn plastic – all in an effort to minimize the waste. In addition, Three Twins gives back to environmental non-profits through its affiliation with 1% For The Planet, a group of over 200 businesses that give at least 1% of their sales, regardless of profitability, to environmental efforts.